FORT COLLINS, CO--(Marketwire - April 23, 2008) - Embark on the latest OtterBox experience with a completely redesigned website. Easily navigate to find the latest in protective cases for technology and valuables through an interactive, creative interface at http://www.otterbox.com. Combining customer feedback and expertise from a new team of website development and optimization specialists, the revamped OtterBox site ensures even first time shoppers have the optimal online experience. Product pages include clickable drawers to showcase product photos, videos, reviews, PDFs, specs and related accessories so visitors understand the products to find the perfect solution for their needs. "We wanted to create the ultimate OtterBox experience so website guests can be educated on our products and feel connected to our company," said Curt Richardson, CEO of Otter Products, LLC. "Our new design is well organized so visitors can easily find products, get answers to their questions and explore the OtterBox culture." With a variety of cases and accessories for iPods, iPhones, PCs, smartphones, PDAs and other valuables, OtterBox required a site that could systematically break down product lines and direct customers to appropriate areas of the website. By moving the main navigation bar to the left, new and return users can quickly browse to the desired web page. 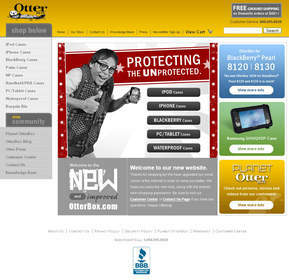 "The new site design is streamlined and user friendly," said Mary Knaus, Website Business Development at OtterBox. "To keep it fresh, we plan to update the home page design every week or two depending on the season, product announcements, holidays and what's going on in the world; it will make the site dynamic and exciting to visit." An incorporated search function enables visitors to find what they're looking for no matter where they are on the site and a knowledge base helps answer product questions. "We also improved the design of our site to make it more search engine friendly. This helps increase our online visibility, making it easier for users to find our site," said Chad Atchison, Website Optimization & IT Specialist. The OtterBox culture can be found by clicking links to the company's MySpace page, Blog and Planet OtterBox, where people around the world share their OtterBox adventures. The site will also incorporate a sponsorship page with information about organizations we support. Founded in 1996, Otter Products, LLC. is recognized in the design and production of rugged and now semi-rugged cases to safeguard technology and valuables. Built upon fundamentals of hard work, creativity, and perseverance, OtterBox is a powerhouse of innovation, manufacturing quality cases with a 100 percent lifetime guarantee. For more information visit www.otterbox.com or call 888-695-8820. About this company Otter Products, LLC.